Though this is just our third official meeting with Paul Gayten we’ve come across him in other guises along the way, as well as mentioning him in passing when delving into how this whole rock ‘n’ roll movement began. His short-form biographical headline should read simply that he was one of the most multi-talented figures in rock history with a list of credits (as an artist, songwriter, producer, sessionist, inspiration, you name it) that touched the careers in one way or another of a litany of major artists. But in many ways his lurking on the edges of history while rarely commanding the spotlight himself typifies Gayten’s fading legacy as one of rock’s sadly obscure originators. The nephew of legendary pianist Little Brother Montgomery, the young Gayten followed in those footsteps becoming very proficient on piano while still a teenager and soon was leading (by all accounts) the best post-war band in New Orleans. According to Dr. John, who was just a kid starting to hang around the music scene of the day, Gayten’s band would never play a song the same way twice, becoming master improvisers and soon securing a recording contract with DeLuxe Records out of New Jersey. It was Gayten’s first session in fact which put the label on the map, scoring hits for both himself with True and while backing Annie Laurie on Since I Fell For You, in the process opening the door for New Orleans to be the genesis of rock ‘n’ roll itself when thanks in part to that success Roy Brown was the next Crescent City artist to be signed to DeLuxe that summer and of course we all know what that led to. But once again Gayten’s misfortune was that he just missed being the guy who kicked off the rock era himself as his trailblazing Your Hands Ain’t Clean was relegated to the B-side of the sappy “True”, thus having no real impact. Then when New Orleans became the focal point of the new movement with DeLuxe signing up everyone with a Louisiana residency to further the cause of rock as a whole, Gayten, both on his own and with Laurie, chose to display their stylistic versatility instead of aiming to take control of the rock movement before it fully coalesced. When they did delve into it the results, while promising, simply weren’t going to define it going forward. Though he lived until 1991 there’s very little to be found about Gayten these days. His reminisces, thoughts, views and stories would’ve been invaluable for peeling back many of the layers that have obscured rock’s birth and subsequent rise and arguably no one figure was involved with it from the very beginning in more ways than Gayten. In fact there’s only two people in rock’s first decade that have a résumé as deep as he does, Johnny Otis and Dave Bartholomew, yet both of them have name recognition that exists to this day while Gayten is virtually forgotten by all but a few lunatics. The ideal comparison to make is with Dave Bartholomew. Both were from New Orleans and got their start professionally at the same time, they each parlayed their skills into viable careers on both sides of the glass and over time they saw the success of their own recordings gradually take a back seat to those they were working with… the parallels are uncanny. The differences between their ultimate fates though are just as striking and reveal a lot about their personalities as much as their aspirations. Let’s start with this: It was actually Paul Gayten who gave Fats Domino his first significant public exposure by calling the shy pianist up to the bandstand at a standing room only show Gayten was headlining in Hardin Park and had Domino, who was still dressed in his overalls from work, give a well-received solo performance in front of the biggest audience he’d ever encountered. Gayten, who at the time had one of the hottest records in black America and was the biggest star in New Orleans, later hailed Fats down on the street and took him to lunch, showing him a kindness that was rare for such a major name and over the course of their exchanges giving Domino the encouragement that he might make it in music himself. But it was the more competitive, often prickly, Bartholomew who later got Domino his recording contract with Imperial even though the two were barely acquainted and Dave had reportedly even kicked Fats off the stage before when he tried sitting in with his band. But Bartholomew knew Domino was talented and he could sell records if handled right and so Dave swallowed his ego and for fifteen years worked alongside Fats, guiding his career into super-stardom. Ironically Bartholomew did this using many of the musicians who’d come up through Gayten’s band, including one of the great guitarists of the day in Edgar Blanchard, rock solid bassist Frank Fields and legendary saxophonist Lee Allen. But Gayten lost band members with regularity, either not concerned with keeping the cream of the crop under his control, or due to unspecified rifts which sent the musicians looking elsewhere, such as when they left him en masse to join Jewel King on the road. Gayten, as was his nature, took it in stride and simply put together another band that was deemed to be just as good. The similarities, and accompanying differences which ultimately set them apart, don’t end there, as both men were accomplished songwriters with a roll call of hits to their credit, but whereas Gayten’s were hits of the moment, huge hits, even some #1’s, they weren’t as enduring as the hits Bartholomew was cranking out, songs which have grown in stature over the years while Gayten’s sides are more forgotten. One story seems to epitomize the fundamental difference in their personalities and goes a long way towards explaining their respective destinies. Gayten was situated at a club called The Brass Rail for years in the 1950’s, playing gigs and acting as a sort of tutor for a lot of the young acts coming up, helping to craft their sound and build up their presentation. Al Reed was a promising young artist who asked him for an audition. Gayten liked what he heard and told Reed he’d call Chess Records, for whom he was then working as an A&R man, in order to get the go-ahead to cut some sides with Reed. Dave Bartholomew happened to stop in as this was going down and also liked Reed’s sound and promptly told him – in front of Gayten no less – that he’d would cut Reed tomorrow, and that unlike Gayten who needed the white man’s “permission”, Bartholomew was autonomous with Imperial Records and could do as he pleased. Not surprisingly Reed signed with Imperial and recorded his debut the very next day, as promised. In the end the ultimate destinations of their respective career paths seemed to have come down to the fact that by nature Gayten was passive while Bartholomew was aggressive, and though they were arguably equally skilled in every other way that difference in personality determined each of their fates. But then again it might’ve been another factor as well, something more instinctive between the two. Bartholomew had an amazing ability to gauge the marketplace and sense what would sell, before he even had a track record to go on he instinctively gravitated towards a commercial sound although in some ways that style went against his own personal tastes, but he was prescient enough to realize his preferred Dixieland jazz upbringing was no longer in vogue and he never looked back as the hits rolled in. He was a perfectionist who decades later still cringed when recalling a missed note or a bad mix on a record and from the very start the proud, highly intelligent and ambitious Bartholomew viewed his work in the studio as his opportunity to leave his mark on the world and he worked harder than anybody to ensure it was one worthy of him. Gayten on the other hand seemed not to care much for credit and wasn’t meticulous about crafting a legacy as he plied his trade largely in the shadows. Musically he jumped freely between styles and almost seemed to play as much for his own pleasure at the moment rather than with any goal of reaching the public at large. Even in instances when he had material that was on the cutting edge he often didn’t realize how close it was to being perfectly situated for mass appeal and instead of refining it and polishing it up, making each record as perfect as he could manage to give him the best shot at glory, he sent it out as is, missing the chance to create a sizable impact even when he was staking out new ground that others would soon follow and make their own. Case in point, Hey Little Girl, a song destined to go down as a defining performance… for somebody other than Paul Gayten. Though not a hit for him either, Hey Little Girl is known by rock aficionados as purely a Professor Longhair song. In fact it is considered one of his best records in a long career that was largely uncommercial but has gone on to be seen as revolutionary. In most reissues of his material this song’s authorship is even credited to Fess (as Roy Byrd, Longhair’s real name), but he didn’t write it at all. Gayten did. Gayten also cut it long before Fess even stepped foot in a recording studio, as evidenced here. In fact, as distinctive and idiosyncratic as Longhair’s version sounds even THAT was taken almost entirely intact from this, the original Gayten performance. Of course Gayten gets absolutely no credit for any of this! Though funk wasn’t created for another 15 years Gayten’s Hey Little Girl is decidedly funky. With its glissando opening leading into claves playing a catchy pattern behind his herky-jerky piano riff it comes as something of a surprise when Gayten’s voice enters with a spoken word question to a hot young lady he spots in a bar, asking her out in a cool, laid back cocky manner that is rakishly charming. He manages not to sound threatening in any way while coming onto her, despite his somewhat crude, or at least shamelessly forthright comments to kick it off. But this isn’t some lecherous pervert cruising the bars looking to seduce and possibly abduct a virginal young girl for his own sick pleasure. Gayten sounds legitimately smitten, though clearly amused at the same time, almost as if he knows she’s too inexperienced to feel comfortable going out with him and thus his come-ons are going to end in demure rejection, but he’s still envisioning what a good time they’d actually have together if she let go of her inhibitions and went along with him. It’s appealing entirely because of the way he presents it. Despite the insistent churning riff behind him which takes on an air of danger, it’s not featured in a way that hints of anything unseemly happening once the track ends, the doors shut and the place grows dark. He makes it clear he’s just flirting and that gives this an air of playfulness rather than an ominous foreboding mood, which truthfully would probably work too, but it would take away much of the fun in the process. Longhair’s more well-known version, which we’ll review here in… oh, about three years, follows this blueprint very closely, but he embellishes it more with his own unique stamp. Though Gayten imparts it with some notable touches as well, playing a very good piano in some extended breaks and using more of a conversational singing tone, his approach is not as wild and thus not as instantly captivating as Fess whose off-key bellowing also adds to the charm of his version down the road. Gayten, while delivering a good performance, doesn’t offer a defining one, which seems to be his lot in life. A half step away from greatness at every turn. Of course it’s unfair to compare this Hey Little Girl to a record that hasn’t even been made yet, and for the time this came out it was a very solid effort, one squarely in the rock kingdom which helped broaden the style even further. 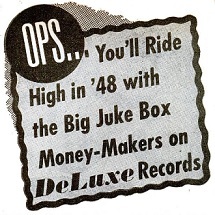 Though it didn’t crack Billboard’s more conservative charts, it did a lot better in Cash Box’s regional surveys, hitting #2 in Chicago, #3 in New Orleans and the Top Ten in Los Angeles, and that success along with the quirky nature of the record gave even more indication that Gayten was someone to watch going forward. But the more we watch the more our expectations start to feel a little unmet with him. It’s hard to say we’re being let down by someone who’s been directly involved with only four records to date on Spontaneous Lunacy and all four have been average or slightly above average, which as the Scoring System lays out is no backhanded compliment at all. But it’s just when studying Gayten’s progression and comparing it to what we can tell he’s capable of and yet still seeing no real leap forward in execution, only small incremental steps, or more maddening yet, sometimes one step forward and one step back, the frustration with his output starts to build. It’s far too early to give up on him ever fully delivering on his potential, but we DO know how it turns out in the long run and it’s not too early to be able to tell why he’s been reduced to merely an historical footnote, when those like Dave Bartholomew, or Professor Longhair for that matter, are widely acknowledged to have made history by comparison. Gayten, as solid as he was in every regard, almost seemed to sit back and take things as they came, whereas others – the ones history remembers – went out and got what they wanted by sheer force of will. This is still well worth hearing, but like Gayten himself maybe, you’ll be excused for waiting for it to fall into your lap rather than actively hunting it down. 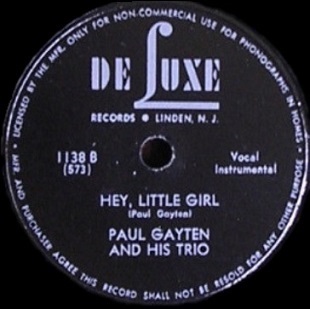 Leave a reply on "Paul Gayten: “Hey Little Girl”"